Butter Sugar Cookies are my favorite kind of cookies, and the easiest to make. 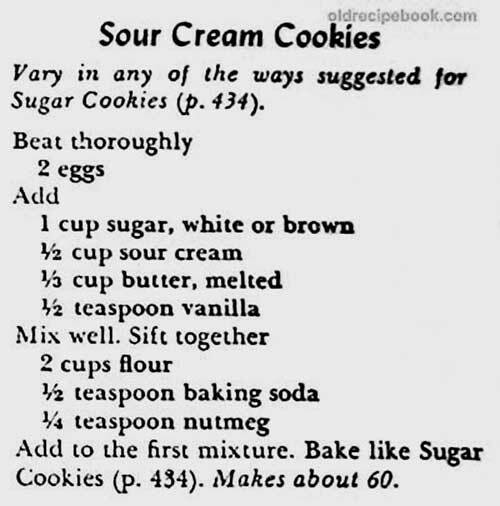 Normally the recipe calls for you to "press flat with a sugar coated glass bottom, but on this page there are several Drop Sugar Cookies too. For cookies that you roll out and cut go to the Butter Cookies page. Find my favorite Holiday cookies on the Christmas Cookie page. Buttery Sugar Cookie Tip: Old fashioned sugar cookies need the distinctive flavor of butter, but you may use a substitute successfully for the variations. For richer cookies, use more butter (up to 1 cup). To deepen the color, add an extra egg yolk. To emphasize the butter flavor, brush baked cookies lightly with melted butter while they are still warm. Set the oven at 375°. Stir into the butter mixture and blend well. Arrange by teaspoonfuls on a buttered cooky sheet, 1 inch apart. Bake about 8 minutes. Makes 50 to 60. Sugar Storage Tip: A sack of lumpy sugar can be made right if you place it in the refrigerator for 24 hours. In a mixing bowl, cream butter and sugar. Beat in eggs and vanilla. Combine flour, baking soda and salt and gradually add to creamed mixture. Shape into (3) 10 inch logs, and wrap in Saran wrap or waxed paper. Refrigerate 1 hr or until firm. Unwrap and cut into 1/4 inch slices; place on greased baking sheets. Sprinkle with sugar, or colored sugar. Bake at 375 for 8-10 minutes, or until lightly browned. Cool on wire racks. NOTE: Makes a large batch, about 8 dozen. These are easier to make than traditional sugar cutouts. The logs can also be frozen, to bake later, just thaw in the refrigerator. Mix sugar and shortening with hand like pie crust. Add eggs and sifted dry ingredients, and nuts. Make in rolls and put in ice box a few hours. Slice and bake in a 350 degree oven for a few minutes. Mix all ingredients together. May add additional flour to make dough stiffer. Form in roll; place in refrigerator overnight. Slice and bake at 375 until slightly browned. Sugar Storage Tip: To soften brown sugar, place a piece of soft bread or a slice of apple in the container, or grate the amount you need with a cheese grater. Place in refrigerator and chill thoroughly. Roll into small balls and place on a cookie sheet. Press each ball twice with the bottom of a glass that has been dipped in soft butter and then sugar. Re-dip glass in the sugar before each "press." Bake at 350 for 10 to 12 minutes. Cream shortening and sugar. Add eggs, flavorings and salad oil. Beat. Combine dry ingredients and add to sugar mixture. Form into 1 inch balls. Place on cookie sheet. Flatten with glass dipped with sugar. Bake 10 minutes at 350°. 4 c. sifted flour plus 4 heaping T.
Cream sugar, margarine and oil. Beat in eggs. Sift dry ingredients and mix; roll in balls. Press with a glass dipped in sugar. Bake on ungreased cookie sheet. Bake 10 to 12 minutes at 375°. Cream butter and sugar. Add flour, a little at a time, then vanilla. Stir until blended. Roll dough into small balls the size of a walnut, then roll the balls in sugar. Flatten with cookie stamp or bottom of a glass. Put onto ungreased cookie sheet. Bake until edges are lightly browned, 17 to 20 minutes. This dough needs no chilling, rolling or cutting. It is easily doubled. Preparation time: 15 minutes. Baking time: 17 to 20 minutes per batch. Heat oven to 300 degrees. Preheat oven to 350°. Cream together the softened butter and powdered sugar until fluffy. Blend in the vanilla. Blend in flour and mix until fluffy. Stir in chopped walnuts. Drop from a tsp. on an ungreased cookie sheet, about 2 inches apart. Use the palm of your hand or spoon to press the cookie flat. Bake for 10 minutes. After cookies are cooled use a sieve to sprinkle powdered sugar. Tip: you can also use pecans. Cream shortening, egg, vanilla and sugar. Sift dry ingredients. Mix thoroughly to above. Form ball size walnut. Dip top in water, then sugar. Place in ungreased pan. Bake at 350 degrees 8-10 minutes.